It's been a funny few weeks. Not funny haha but funny strange. And not really strange just ..... not normal. Whatever normal is! I guess it's just life. Last week I said that "...... life seemed to strike" and of course what I'm referring to is the bad side of life; that said, perhaps not bad but certainly less than good. All of that combined with other stuff was stopping me from painting; it was at the root of why I couldn't be bothered with art. However, I'd started painting again and while doing so helped block all of that stuff out for a little while it was all still there like this black cloud hanging over my head. Saturday was so grey; indeed so grey that it seemed to match my mood. After moping about for a while I decided I needed to create, even if I was just doing some backgrounds at least I would be doing something creative. As I started to get set-up I was aware of brightness outside even though the sky was grey and it was then that I realised that I was looking at the most magnificent autumn colours in my garden. My mood started to lift a bit. 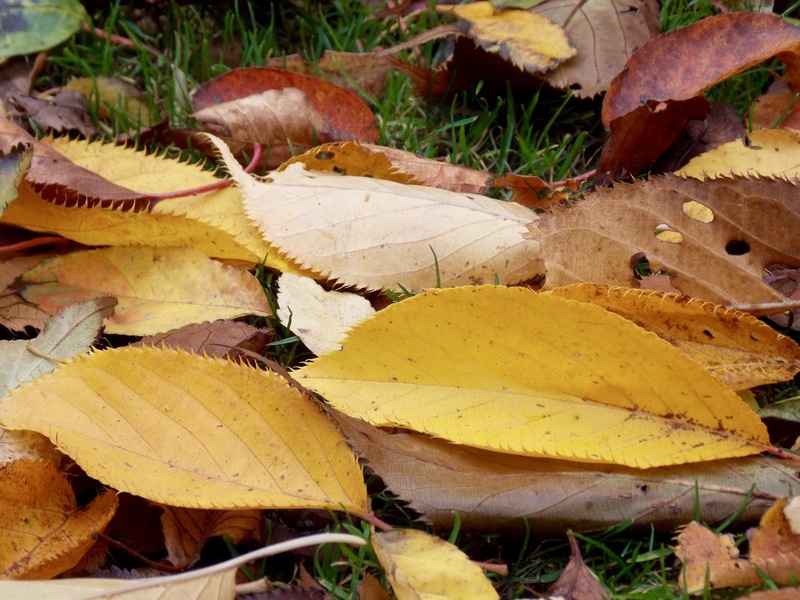 Although the sky was grey the leaves on the trees and those already fallen and now lying on the grass were glowing. I didn't intentionally set about creating an autumn piece but clearly this beautiful sight influenced and inspired me - as nature so often does. Given everything that's been going on I thought that it might be good to start my page with some journaling. It wasn't stuff that I would want to be seen so I decided that I would write in a way that it would be hard to make out what was there. I wrote in a large scrawl deciding that I would not worry about grammar, punctuation or spelling. Though I guess I'm a bit 'old school' as every so often I found myself stopping to think about just that! I wrote horizontally then turned the page sideways and wrote vertically. I decided that I would use my Gelli Plate to create the background. While I didn't want my journaling to be seen I was happy for it to show through a bit as the first layer. When I started to put colour onto the Gelli Plate, I realised then that I was being influenced by what I was seeing out the window. My page was much bigger than the Gelli Plate but I was happy with that as where one print was overlapping the other I was getting increased depth with the additional layers. My only concern was that as I wasn't letting the layers dry in between I was in danger of creating mud. So out came the heat gun aka the hairdryer. I then had a bit of a fail. I got some leaves from outside, placed them on the Gelli Plate and tried to use the brayer to put paint on over them. It didn't work. 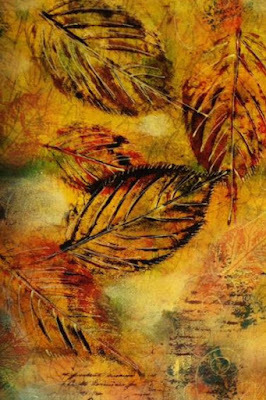 So I then took a couple of different sized leaves and with my finger applied a layer of paint to them really working the paint in so that the veins would be highlighted and I then used them as a stamp on the page. I used the brayer to apply more pressure. I liked the way this was working but felt that the leaves needed to pop a bit more. I thought about going round them with pen but didn't want a full and hard line on them. 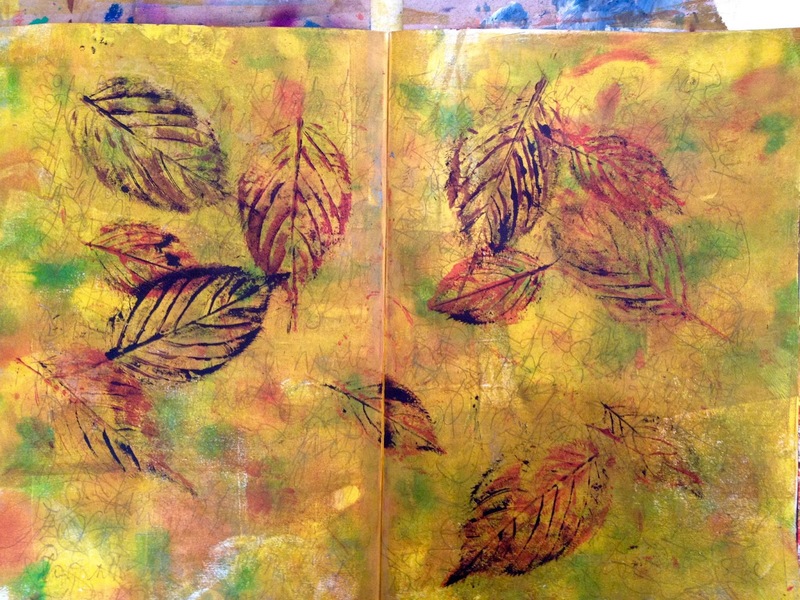 So I took the leaves again and rubbed in some black acrylic and stamped over each of the prints already on the page. This gave the leaves a bit more definition. By now, I was at the point where I was thinking that this was shaping up nicely but there was something missing. Did I need more leaves? An aside! This thought took me back in my mind to when I was about 17 in my High School art class. We'd been asked to paint a scene of umbrellas in the rain. My art teacher saw my finished piece and said it was good apart from one thing - there weren't enough umbrellas! He was clearly a city boy used to seeing lots of people in the street. I was a country girl where even seeing the three or four umbrellas that I'd painted would have been a lot. It's all about perspective - wish I could have that conversation with him now. Stamping, highlighting and quote added - job done! Anyway, I decided I didn't want to add more leaves but I did want more depth both with more layers and some deeper colours. So I added some stamping and applied colour with my fingers including gold to try and get the 'glow' that I was seeing outside. I also used a gold pen just to add some little marks here and there. I felt way better when I had finished than when I started. I thoroughly enjoyed watching you demonstrated how you use the gelli plate. 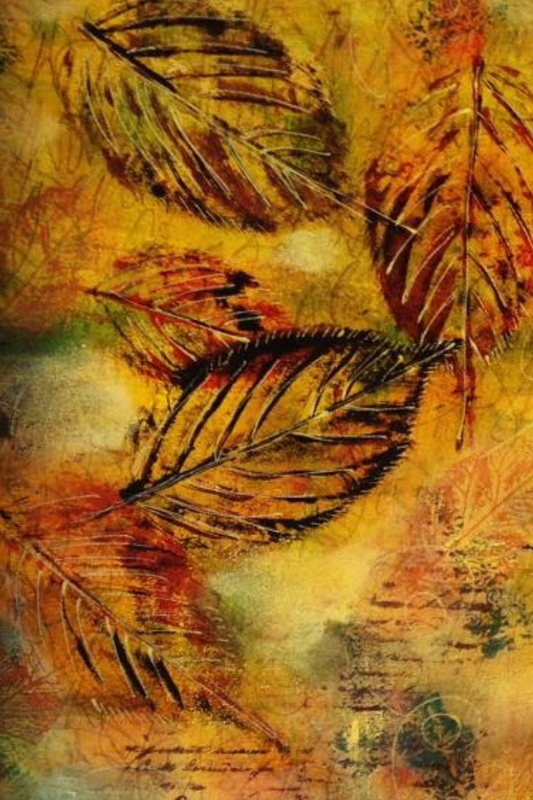 I really like your prints, and I was particularly taken by the leaf spread, you did in your journal, so I had to come over here and check out how you create it, Thank you for sharing this technique also. Invtrdible therapy. Thankyou so much for sharing. About Me - I'm a mixed media artist and art journaler.